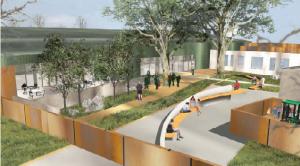 The Community Action Partnership of San Luis Obispo (CAPSLO) is ready to seek regulatory approval for construction of its long-awaited homeless services center that is supposed to be a one-stop shop for San Luis Obispo County’s impoverished residents. On Wednesday, CAPSLO officials will appear before the San Luis Obispo Planning Commission seeking a use permit for a proposed 150-bed facility to be built on a vacant lot across from the city corporation yard. The homeless center would consolidate the services currently provided at the Maxine Lewis shelter and Prado Day Center at the single location — 40 Prado Road. 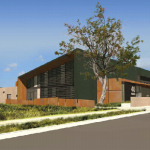 CAPSLO’s plans call for a 20,000 square-foot facility that will include a commercial kitchen, dining room, laundry facility, offices, children’s play area, community meeting room and a lounge. The shelter component will consist of up to 70 beds for males and up to 40 for females, as well as an additional 40 beds separated in dormitories for families. CAPSLO case managers will work on site to try to secure permanent housing for homeless clients. CAPSLO has in the past required clients to turn over the majority of their income in order to enter the case management program. The nonprofit’s safe parking program, which allows homeless individuals to sleep in their vehicles at night, will also shift to the 40 Prado Road location. Currently the Prado Day Center, which CAPSLO operates, is the only location where the homeless can legally sleep inside their vehicles at night within the city of San Luis Obispo. CAPSLO jointly purchased the vacant Prado Road property with the San Luis Obispo Regional Transit Authority (SLORTA). A regional transit center is expected to be built on the lot beside the homeless center. Prior to construction, CAPSLO must attain approval from multiple advisory bodies, as well as from the San Luis Obispo City Council. The council majority, though, has already endorsed the project and contributed city funds toward its design and construction. Why isn’t the SLOPD enforcing the stolen shopping cart ordinance? It’s just ghetto allowing people to steal shopping carts and walk around with them.. That’s a $250+ dollar stolen item and SLOPD doesn’t stop and fine/warn people that there’s a law against stealing things in SLO And walking around with them. These people may as well hang a sign around their neck saying: “I have a 1/4 grand stolen Item I’m walking around with and I’m flaunting it in your face”. If the homeless can’t be fined- Give them community service time. It’s not fair to the rest of society to play by the rules, while another group of people can do pretty much whatever they want without any penalty. Enforce the shopping-cart ban heavily, before the shopping cart situation gets out of control in SLO.. cities like Fresno are doing this, why can’t SLO?